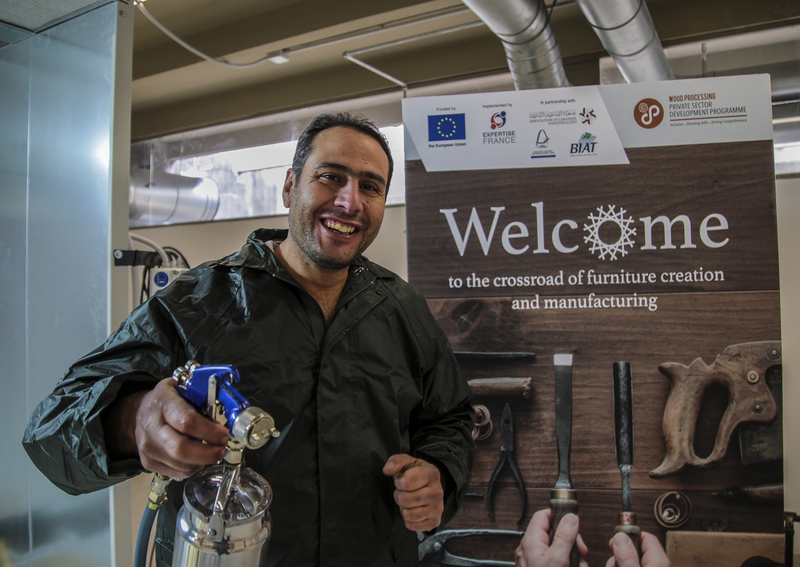 Due to an economic crisis that has hit Tripoli hard as well as a huge decline in furniture manufacture, the PSDP programme, funded by the European Union and implemented by Expertise France, has founded Minjara, a shared platform and brand for carpentry businesses, which aims to foster skills and develop productivity. Its objective is to improve communication and access to the market for wooden furniture suppliers in Tripoli. Minjara has chosen as its base, the majestic setting of the Rashid Karameh International Fair (Northern Lebanon), designed by the famous Brazilian architect Oscar Niemeyer in the 1960s. 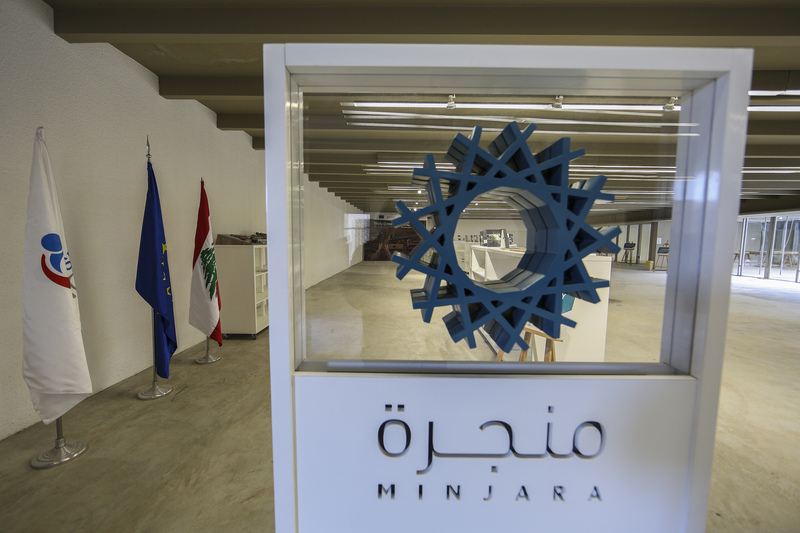 The Minjara programme is a product of the European “Private Sector Development Programme” (PSDP). The project, with total funding of 15 million euros, is entirely financed by the European Union (EU). 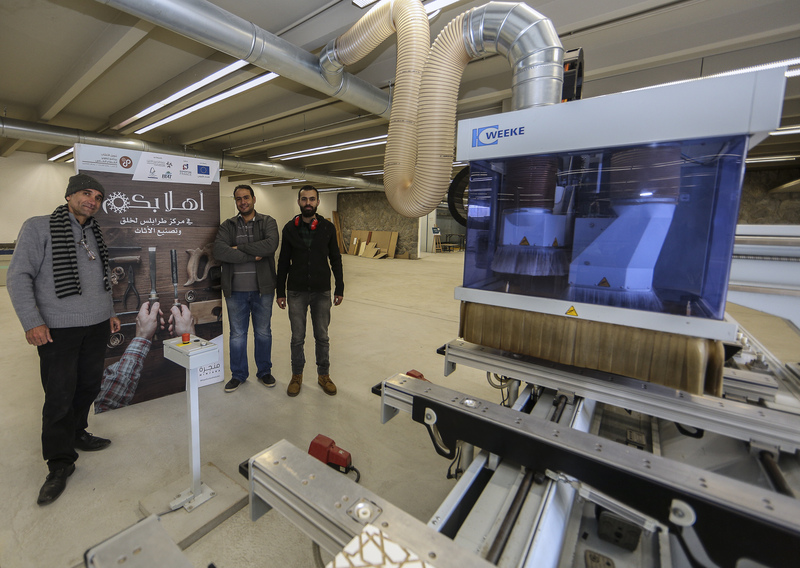 It is divided into three areas: Agrifood sector (supporting local farmers in Akkar and Bekaa), wood processing (supporting artisan carpenters in Tripoli) and access to funding (which supports the two aforementioned sectors). It is implemented in Lebanon by Expertise France. The project operates in partnership with the Chamber of Commerce and Industry, as well as the Association of Lebanese Industrialists. Tripoli has been renowned for its artisan woodworkers for almost 50 years. Throughout the country, people visited furniture showrooms for its beautifully designed furniture. Therefore, wood plays a significant role in the city’s economy, but today this traditional craftsmanship is in crisis. Hence the significance of the PSDP project, which hopes to revive the “golden age” of Tripoli’s woodworkers. Faced with these challenges, Minjara entered the scene. 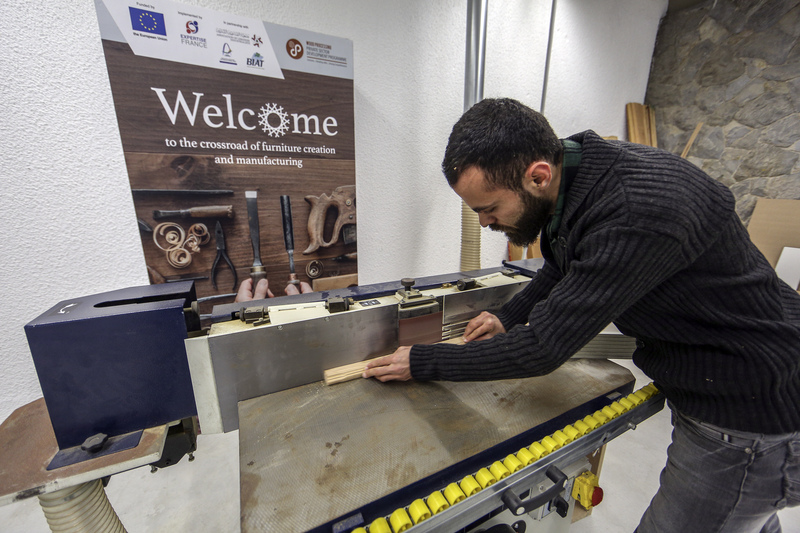 This platform, set to become an association, aims to support artisan woodworkers. It seeks to sustain the efforts initiated by Expertise France under the EU-funded PSDP project, to ensure their long-term continuity. The project is set to end in August 2019 (having started in 2016). Mohamad al-Nizam is 27 years old. 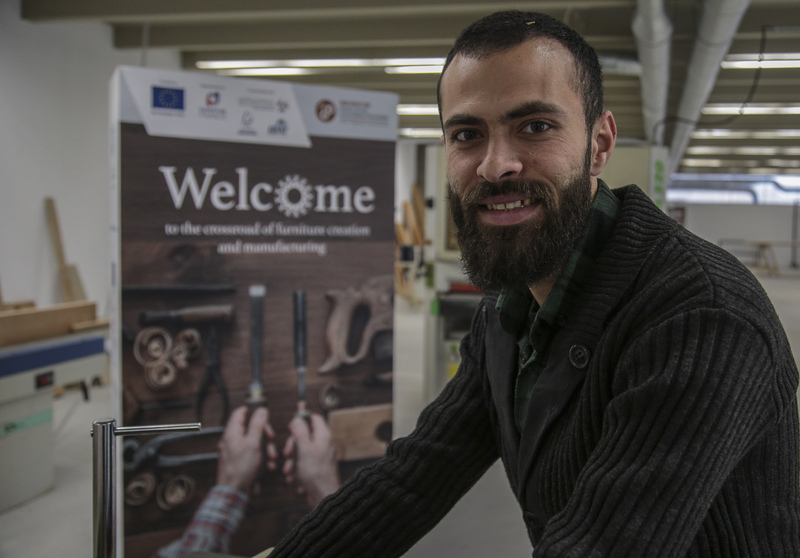 His family owned a carpentry business, which he had to sell two years ago following the economic crisis that has shaken the country, hitting Tripoli’s woodworking sector particularly hard. He signed up for activities and workshops at Minjara to try and return to the industry. “It gives me new experiences and I am learning original techniques”, says the young carpenter. He is also hoping to meet potential clients. For him, the most important thing about the project is its lasting impact. “It is essential that this platform continues to operate, after the end of the project. It gives us hope in these difficult times”. 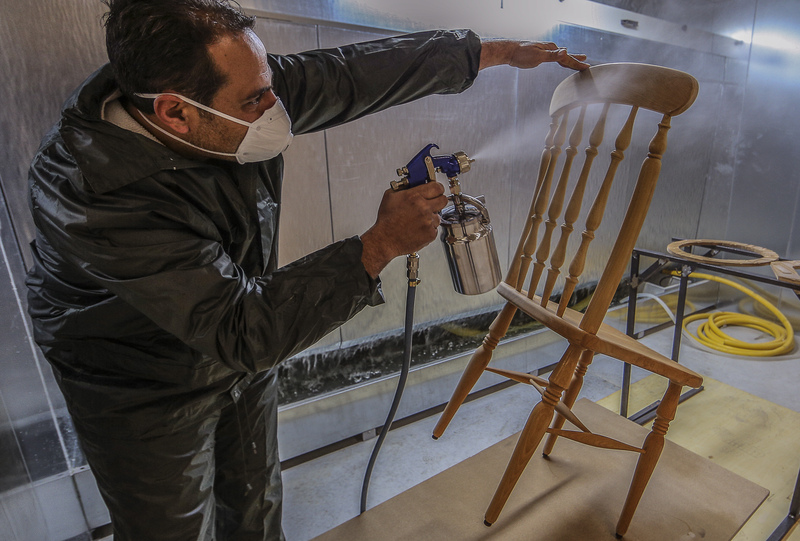 Ibrahim Kurdi, aged around thirty, is a master furniture painter. He has 15 years’ experience. He is working in the spray booth - a futuristic-looking machine. Ibrahim often comes to work at the Minjara workshop. “I use my time here to meet other professionals in the same industry. You can make contacts that opens opportunities”, he explains while wearing a protective mask covering his face. 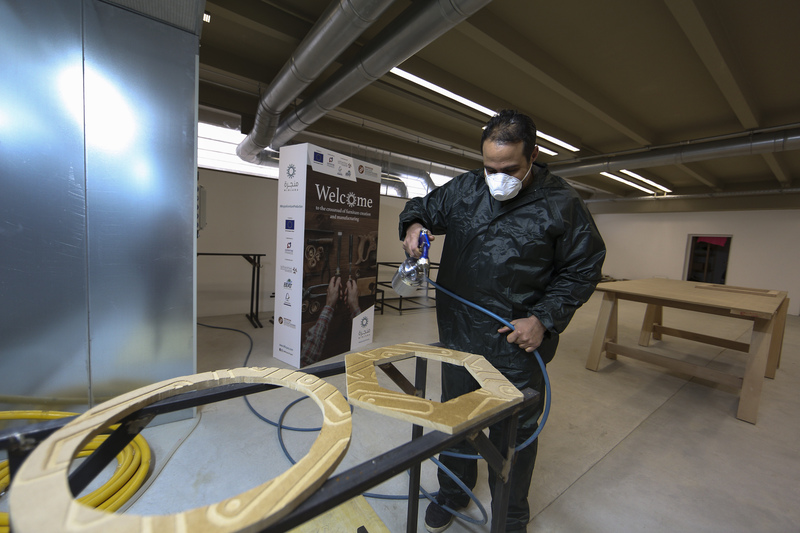 In addition to the PR aspect, Ibrahim notes that the spray booth has many advantages: It gives an excellent finishing and quality, makes his work easier and offers a safe working environment. 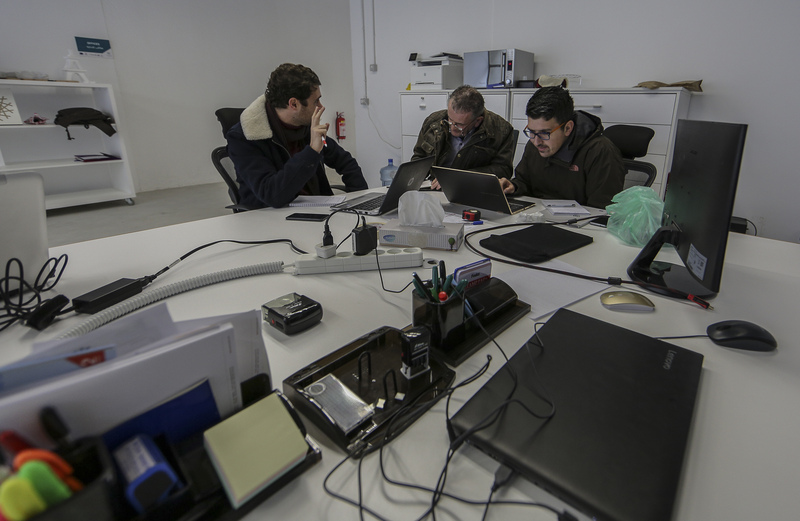 Raafat Nachabi owns a company that employs several people, but the economic crisis shaking the sector has put his workshop at risk. He has already been forced to lay off several workers. Minjara has given Rafaat hope of achieving two goals: obtaining lucrative contracts and, one day, being able to export to Europe. 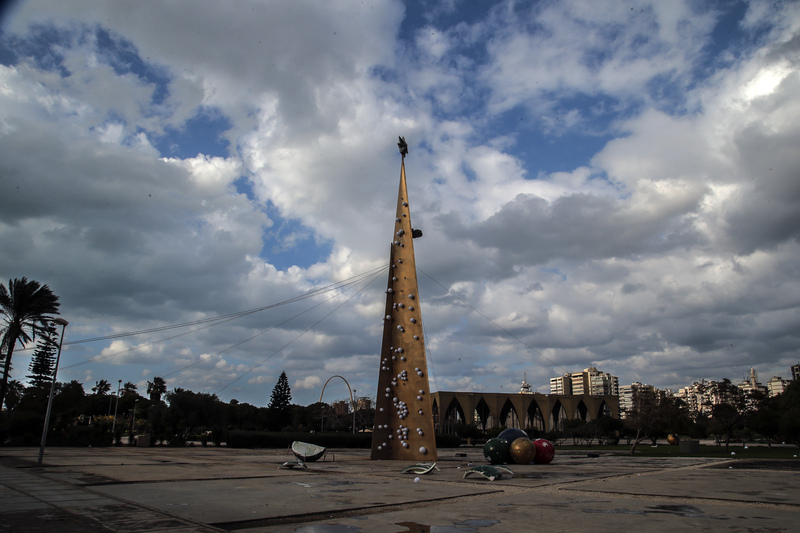 Thanks to the PSDP project, the space occupied by Minjara is the only renovated building in the whole expo centre, as the complex was abandoned during the Lebanese Civil War. The 1500m2 building chosen by Minjara was in ruins. Today it has become a lively meeting place. Symbolically, the space has been designed around a bright atrium, and follows the wood treatment process: The entrance is dedicated to the reception of raw materials, then there is an area used by designers. 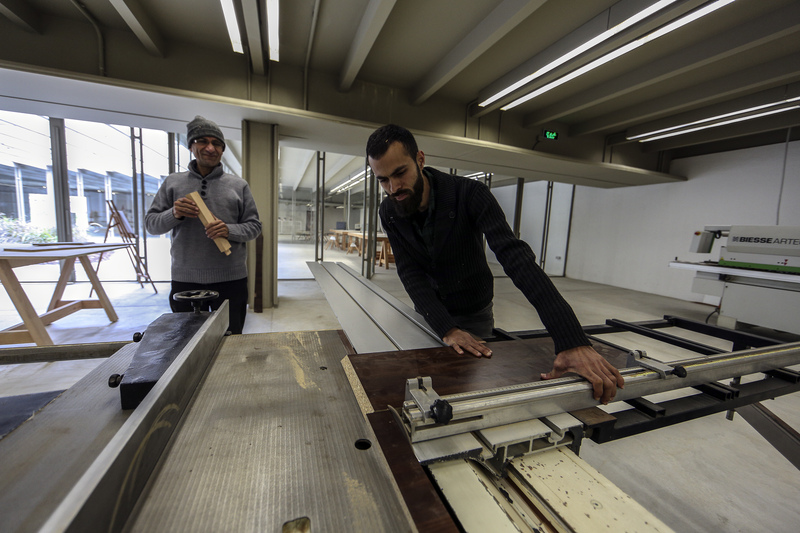 Production takes place in the workshop provided for the carpenters and the exhibition space allows designers and craftsmen from Tripoli to showcase their furniture. The wood processing project is divided into several phases. 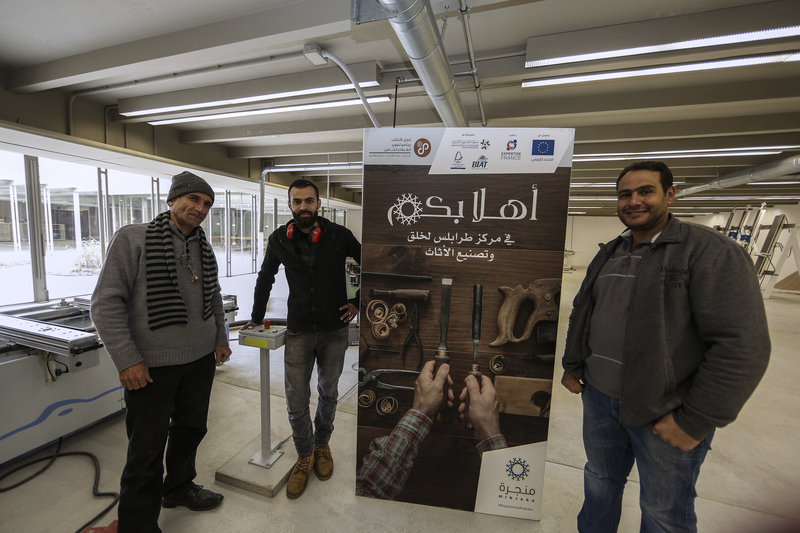 Phase one of the project was to carry out an in-depth survey of the industry in Tripoli and the surrounding area, bringing together all its carpenters. The results were published on “www.furnituretripoli.com”, which contains a comprehensive map of the wood and furniture sector in Lebanon’s 2nd city. This research provides all the key information, from wood suppliers to end clients, via carpenters and furniture showrooms. “Over 400 carpentry companies are listed, all of whom will benefit from the project, at least indirectly”, explains project manager Bechara Chemaly. The same site also offers a series of workshops for those wishing to expand their knowledge and develop certain techniques, or even boost their managerial skills. Market research has also been conducted, providing concrete findings on wooden furniture production in Tripoli and the needs of the local and regional markets. “This diagnosis having been made, it has proved very difficult to convince local artisans to change style”, says Alexis Ghosn, project manager at Expertise France. 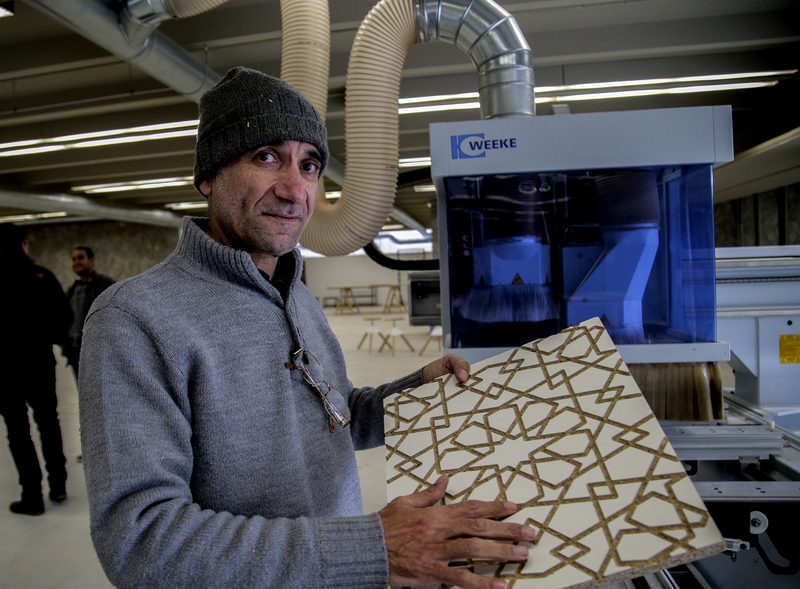 He believes that, “in order for the sector to survive, it must change and produce furniture that meets the demands of the Lebanese market, before considering exporting”. Today, a large volume of furniture is imported from Turkey, China and Egypt, at a very low cost. As a result, prices must adapt to compete with foreign goods. 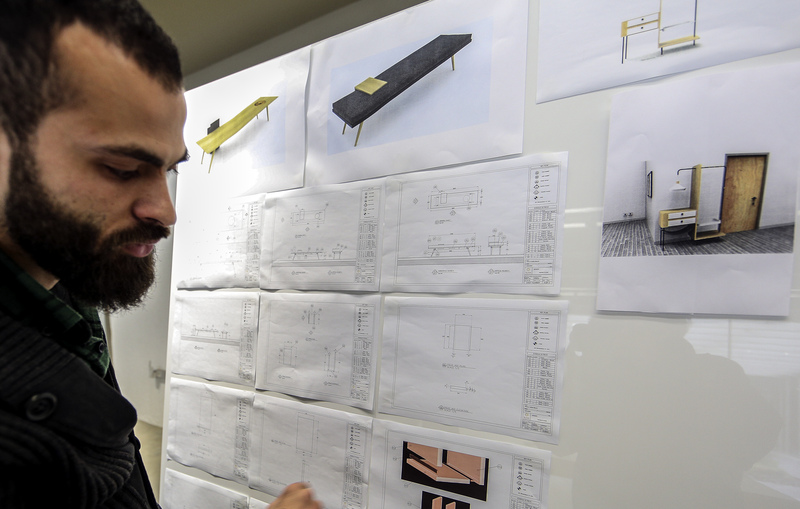 “As a label, Minjara will therefore offer competitively priced furniture, with European quality, produced by carpenters in Tripoli, explains Alexis Ghosn. In that spirit, it is Minjara’s role to bring together artisan woodworkers, furniture designers, interior designers and furniture showroom owners in one space. “There is a lack of cooperation and connection between those who design furniture, those who manufacture it and those who sell it. That’s why we want Minjara to bridge the gap between the links in the sector’s supply chain”, explains Chemaly. The workshop is bustling with carpenters. All eyes are on a huge, state-of-the-art machine at their centre. Ali Boksmati, a young man from Tripoli, is teaching the carpenters how to use it. “This machine is intended to help the craftsmen in their work. It saves a lot of time when carving wood. It also offers a great degree of precision. Just enter your chosen design on the computer, and the machine produces it”.